I love Tanya Byrne. Her debut book Heart-Shaped Bruise was my number one favourite book of last year. So when I heard that Headline were publishing a new book by Tanya this year, I squealed in excitement. And Follow Me Down is a very worthy second book by the lovely Tanya Byrne. It was very addictive reading and it really kept me guessing all the way to those tense final pages. Certain things about the book jumped out at me right away as exciting. I love the boarding school setting. Don't you just love boarding school settings?! And around this boarding school is this lovely, creepy forest where things happen. Second really exciting thing in Follow Me Down is that the main character is a Nigerian teenager, Adamma, who is pretty and popular and has no trouble fitting in, making friends of falling in love. I think there definitely needs to be more non-white characters in YA fiction like Adamma. I think the thing that will follow me around after reading this book is the feeling of deep unease and uncertainty as I finished this book. I love the way in which Tanya Byrne chose to tell this story in two parts, before and after and also in giving us plenty of mysteries that need uncovering. There's a lot within Follow Me Down that we as readers don't know and those secrets ate away at me. I really needed to know and it really isn't until those last few pages that we know for sure. That really ramped up the tension and unease for me not knowing how to feel about certain characters and situations. I did like Adamma as a main character. She comes to this new school a bit unhappy leaving New York and her friends behind, but fairly quickly she makes friends with Scarlett and settles into Croften College. Scarlett is a bit dramatic and attention-seeking and is someone who wields secrets and knowledge like weapons but is also the first person to really reach out to Adamma and make her feel like she belongs. She's a tricky character, Scarlett, as is the relationship between Adamma and Scarlett. I love how Adamma is able to remember both the good and the bad of their friendship. Because it turns out that a boy will come between these two girls. And another one of the mysteries that Tanya Byrne throws at us is the identity of this boy, mostly referred to as him or he so that while you might have an inkling to who it could be ... you're never quite sure! And for me, it really changed my perspective on the story depending on who I thought 'he' might be. 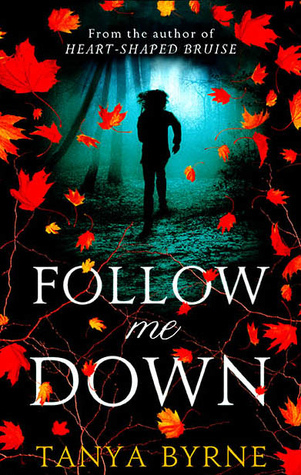 Follow Me Down is a really tense and addictive read. I couldn't put it down once I'd started and by the end I was absolutely desperate to know what had happened and who was involved as well as being fully creeped out by this story. I thought it was amazing and I can highly recommend that you read this book! 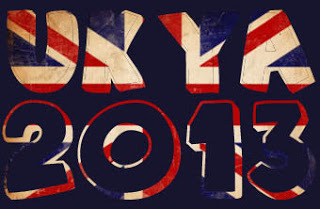 You've just put this on my must-read list ;) Thanks for the review!